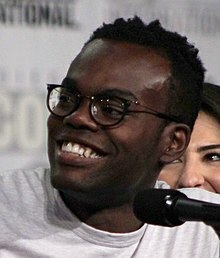 William Jackson Harper (born William Fitzgerald Harper; February 8, 1980), is an American actor. He portrays Chidi Anagonye on the NBC comedy The Good Place (2016–present). William Fitzgerald Harper was born on February 8, 1980, in Dallas, Texas. He graduated from the College of Santa Fe in 2003. He changed his name from William Fitzgerald Harper to William Jackson Harper due to union rules on stage names: "I just took my mom's maiden name and put that in the middle, which was nice, to be able to honor both of my parents." Harper made his Broadway debut in 2014, cast as James Harrison and Stokely Carmichael in All the Way. From 2009 to 2011, Harper starred in the PBS children's series The Electric Company. In 2016, Harper was cast on the NBC comedy The Good Place. Before landing the role of Chidi Anagonye, he considered quitting acting. Harper did not learn about the show's real premise until after he was cast. His performance has received critical praise. In 2017, in between filming the show's first and second seasons, he had a leading role in Zoe Kazan's After the Blast at Lincoln Center's Claire Tow Theatre. 2007 Law & Order: Criminal Intent Chayne Danforth Episode: "Self-made"
2009 Great Performances Melville Episode: "Harlem in Montmartre: A Paris Jazz Story"
2009 Mercy David Green Episode: "I Believe You Conrad"
2010 Law & Order Officer Derek Waldron Episode: "Boy on Fire"
2011 30 Rock Rioter Episode: "Plan B"
2013 Unforgettable Andry Fotre aka Willis Episode: "Incognito"
2014 High Maintenance Andrew Episode: "Geiger"
2015 Person of Interest Strobel Episode: "Control-Alt-Delete"
2015 The Blacklist Security Episode: "Tom Connolly (No. 11)"
2016 Deadbeat Adam Episode: "Death List Three"
Harper has also appeared in stage productions of Ruined and An Octoroon. ^ Saclao, Christian (September 26, 2016). "'The Good Place' Actor William Jackson Harper on Playing Kristen Bell's Onscreen Soulmate in the NBC Series". International Business Times. Retrieved January 6, 2017. ^ Charles, Marissa (September 19, 2016). "William Jackson Harper on Starring in NBC's 'The Good Place'". EBONY. Retrieved January 6, 2017. ^ a b Pape, Allie. "William Jackson Harper on the Other Good Place Character He'd Like to Play". Vulture. Retrieved November 1, 2017. ^ "William Jackson Harper | Playbill". Playbill. Retrieved October 3, 2017. ^ "Alumni • Santa Fe University of Art and Design". santafeuniversity.edu. Retrieved October 4, 2017. ^ "Inside Playbill Gallery | Playbill". Playbill. Retrieved October 3, 2017. ^ a b c Meslow, Scott (January 4, 2018). "The Good Place's William Jackson Harper Had No Idea What He Was Auditioning For". GQ. Archived from the original on January 30, 2018. ^ Andreeva, Nellie (February 12, 2016). "'Good Place' NBC Comedy Series Casts William Jackson Harper". Deadline. Retrieved January 30, 2018. ^ Snierson, Dan (July 12, 2017). "'The Good Place' Star William Jackson Harper Promises 'Acupuncture and Pigs' in Season 2". EW.com. Retrieved October 3, 2017. ^ Magee, Ny (September 25, 2016). "'The Good Place' Saved William Jackson Harper From Quitting Hollywood". EURweb. Archived from the original on January 30, 2018. ^ Radish, Christina (October 5, 2017). "'The Good Place': William Jackson Harper on That Big Twist and Season 2 Challenges". Collider. Archived from the original on January 30, 2018. ^ Perkins, Dennis (January 19, 2017). "The Good Place ends an outstanding first season with its most masterful twist yet". The A.V. Club. Retrieved January 30, 2018. ^ Cleary, Skye (June 21, 2017). "Philosophy on TV: "The Good Place"". Blog of the APA. Retrieved January 30, 2018. ^ Theater, Lincoln Center. "After The Blast | Lincoln Center Theater". Lincoln Center Theater. Retrieved February 19, 2018. ^ Brantley, Ben (October 23, 2017). "Review: Romancing the Bot in Zoe Kazan's 'After the Blast'". The New York Times. ISSN 0362-4331. Retrieved February 19, 2018. ^ "William Jackson Harper". Ensemble Studio Theatre. Archived from the original on January 30, 2018. ^ "William Jackson Harper theatre profile". www.abouttheartists.com. Retrieved January 30, 2018. This page was last edited on 7 March 2019, at 15:32 (UTC).